Some of the damaging insects affected by the Bobbex Rose are aphids, mites, leafhoppers, greenflies and sawflies. Our company, being in the �green� scene, has made this product one that is as compatible with nature as possible, without being an insecticide. Bobbex Rose provides rose enthusiasts with beautiful roses in a healthy environment. 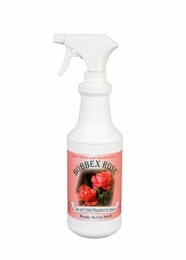 Bobbex Rose reduces the severity of black spot and powdery mildew on roses and other flowers. This ready-to-use formula comes with it's own trigger sprayer.